SPRING. The day we snapped these pictures last week must have been the first official day of spring in Sweden, and I can’t even explain how much I have missed the sun during this long, dark winter. Last week I showed you a sneak peek of this look and here is the full outfit! This entry was posted in Outfit and tagged acne mint green sweater, dinsko, fashion blog, Outfit, shampalove by Carolina Engman. Bookmark the permalink. Ohh and the jacket is to die for! LOVE it! soo cool!can’ wait to see your place! i really lovw that purse!!!! Love the all-black against the beautiful sunny background! Oh how I love this,every piece is to dye for!The jacket,bag,shoes,everything! You look fantastic! Great Pics! you look lovely! i love your jacket and the clutch! Such a cute un-srping-like outfit! Very dark and glamorous! This is one spectacular, all-black look. So excited for you about your new place! Your jacket is fantastic, I love it!! loving that bag a lot! Love the outfit!!! Just great!! I know why you love this jacket so much, it’s absolutely gorgeous! Love the look and the touch of mintgreen! you look so gorgeous! love these pictures next to the water! Really love the Werelse for Mango bag! Stockholm looks so beautiful, now snow till next winter then? The jacket is fun, I really like it! 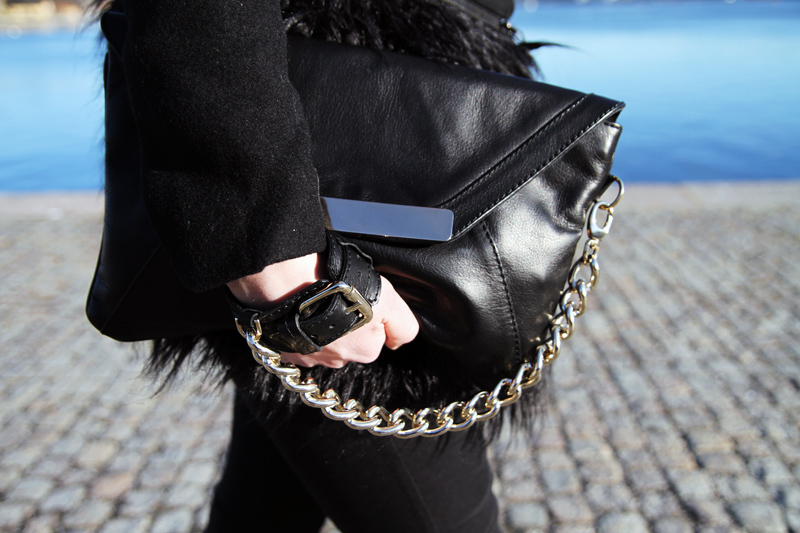 And I love the clutch, it is something really different, so I might be ordering it once it comes out. Aahaha, you are wearing those Din Sko shoes again, my friend actually bought them on a discount in a shop 100 km away from Göteborg xD It was the only place where they still had a size 40, but they are now sitting at her place as there doesn’t seem to be a well-priced way to get them to Germany :( From here to Sweden it would be a mere 17 – 18 €, the other way around it is something like 40 – 60 €. Doh! But as I am gonna visit her soonish, I will just take them with me. amazing photos. I love your jacket and the location. Love those black outfits of you! Loved the mint detail! We’ve been having wonderful weather in Helsinki as well. completely melted away in the city center. Beautiful purse! Can’t wait that it becomes available to buy! You still look all bundled up and snug even though it’s spring there, ha ha! Gorgeous photographs. beautiful pics and i love that bag! You look gorgeous and love that jacket! Amazing!!! I like the outfit! stunning pictures and your outfit is FIERCE!! i think i have seen a similar coat in pinko but in military colour!!! can’t wait to buy your clutch! Love the idea of the clutch + bracelet! That bag is really amazing! My elder sis and I have recently opened our own fashion blog, when you have the chance please have a look at it. Wish you a nice day.. This is a beautiful outfit, the texture in that jacket is amazing. Also, crazy about the all black and the pop of mint. Gorgeous! Love your blog, your look si amazing!!! Love the jacket and skirt! Beautiful!! lovely outfit~! the jacket is nice! you look great, love this whole black outfit! holy crap i love this coat. Amazing outfit and an even more amazing smile! Love the sweater and clutch. Great outfit as always. LOVING that jacket! yeah, spring is coming, finally!! in love with the feathered edges! You look absolutely amazing! I adore your jacket – it’s stunning. Pop of mint green looks so sophisticated with black. And adore the background of the pictures – I too cannot wait for Spring to arrive QUICKER!!! I wish I could see your necklace better, seems like theres something rad hiding under that collar! Your looks are always perfect! You look amazing! The Werelse collection for Mango looks so put together and of good quality, love it! I was in Stockholm last spring and it really is one of the best places in Europe to hang out and enjoy those first hours of spring-sunshine! Love the outfit!! I like how you snuck in the pop of color! The pants are pretty sweet too! 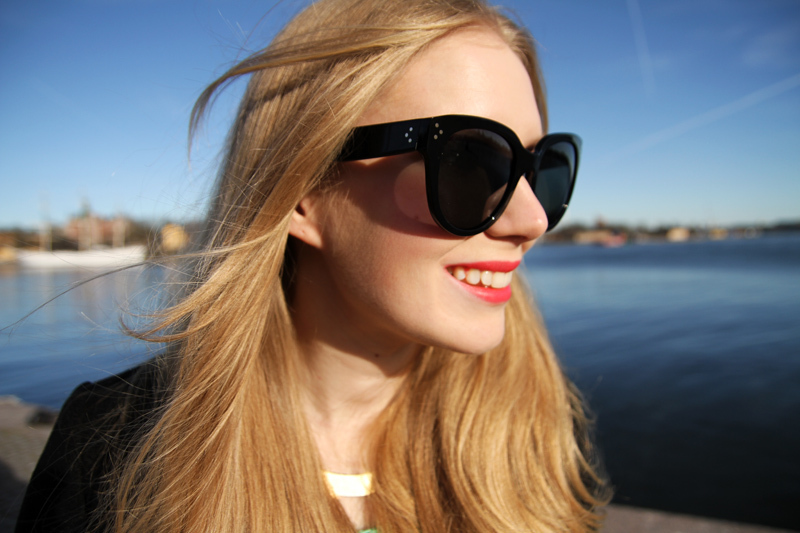 love the Celine shades and red lips! Love the outfit! Nothing is better that full black but lots of texture! Great shots. The jacket is stunning! And I love the pic’s where you’re smiling! Keep those coming! i adore your style :) such a lovely blog!! I like those sunglasses a lot. I hope it is sunny there. You look great. Absolutely gorgeous outfit, and good luck with the moving! Very nice jacket. You look so pretty! Kisses. Längtar SÅ till den 15 april och werelse for mango, väskan är kanonfin! You look so classic, I adore your jacket and your sunnies! Looking fabulous, hope your move went smoothly. Very obsessed with that clutch! That jacket is incredible! I love all in black as well, it is so flattering. That jacket is so gorgeous! Black is definitely coming back! a pretty girl in black! awesome! Still loving the blog fashion squad! lovely photos!! you are very welcome to look at my blog and maybe leave a comment with your thoughts :) thanks! WOW!! I love your outift!! Especially the sunglasses are wonderful. I’m really beggining to love that clucth!! Cute outfit and super adorable clutch! Elizabeth & James Jacket? Love it! Gosh this jacket is so amazing! Love the pictures. LOVE THE COAT AND THE GREEAN T-SHIRT! VERY COOL! Pretty pretty lady! That jacket is bloody incredible. Love this look! obsessed with the jacket! wow, love your coat. it’s so beautiful! We’ve been enjoying the same weather here in London. You’ve got to love the first signs of Spring and the opportunity to shed the layers. Good luck with your move, I can’t wait to see pictures of your new place. I’d love for you to have a look at my new blog…. Great look:) we miss Scandinavia!!! That is PERFECT! I am always looking for interesting trays and bowls like that from thirft stores. Just adds somethign special. Your bangles are fantastic, by the way! omg Black with black has never looked so good. and that bag is just to die for!